SYNOPSIS: This is an oddball, WW II, drama ,action, comedy with P.O.W. Oliver Reed leading a zoo elephant to safety through enemy territory full of Nazis. They're heading to Switzerland for their freedom. Plenty of big action scenes and laughs. Michael J. Pollard co-stars as the "hero" helping him out. 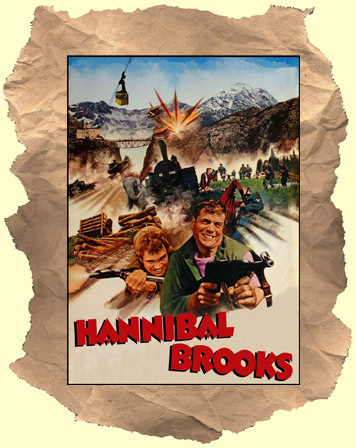 BONUS #1: This dvd also includes a bonus short film A NEW KIND OF HERO: it's a behind-the-scenes look at the making of HANNIBAL BROOKS and profiles the unlikely hero Pollard. This 10min rarity has turned a bit pink over the years. But, seriously, where else are you going to see it? BONUS #2: Original theatrical trailer. *For more see: The Trap, Flight of the Eagle, Gulag and What a Way to Die!